You don't have to be a fan of the show to enjoy this weird, funny, and oddly enjoyable iOS game. Who knew the world needed a Pokémon trainer parody? Adult Swim Games and Big Pixel have created a thoroughly weird, funny, and oddly enjoyable collect-and-battle-em title in Pocket Mortys. For those who aren’t familiar with Adult Swim’s Rick and Morty television show, just think of Back to the Future if Doc Brown was an abusive alcoholic and Morty was a neurotic, voice-cracking teenager. But you don’t have to be a fan of the show to enjoy this game—here are three reasons why Pocket Mortys is the next role-playing-game you download. Meet Rick and Morty… and Morty… and Morty…: In this game, scientist Rick discovers that “Morty fights”—again, think Pokémon-style battles, here—have become a popular hobby in other dimensions. Rick has to defeat six other Ricks (another Pokémon nod, but this time to its gym leaders) with his team of trained Mortys. Yes, the entire premise of the game is a grandfather training and then throwing versions of his poor grandson into combat. But in defense of Rick, battling Mortys is a great deal of fun. True to Pokemon, you’ll navigate a world with varied terrain, peoples, and loot. The many shapes of Morty: The combat system of Pocket Mortys presents you with a rock/paper/scissor dynamic. 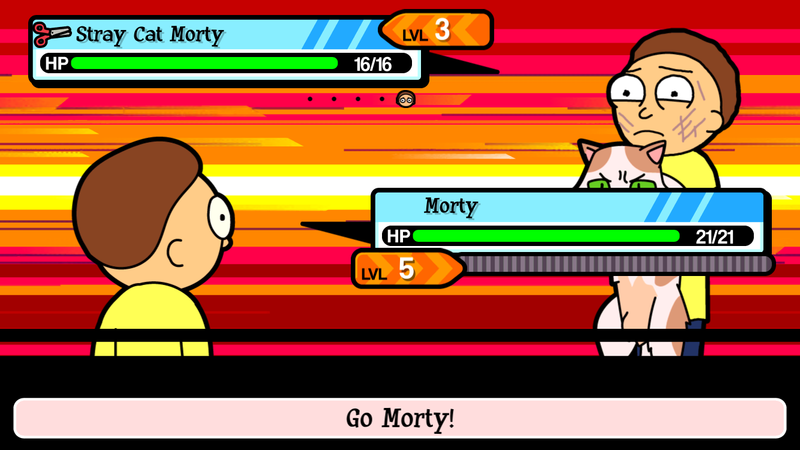 Mortys have to be defeated in the wild and captured before they can join your team—your “Cyclops Morty,” for example, can level up through combat and even unlock new (silly) moves, like Belch, Flail, and Cry. While the moves get better and the Mortys are somewhat varied—you’ll encounter old, mustachioed, stray cat, veiny, gaseous versions of poor Morty—Pocket Mortys cannot match Pokémon when it comes to range of creatures and moves. But it does offer a surprisingly robust range of power-ups and a clever crafting mechanic—there’s even a hospital/med bay to heal your wounded Mortys after a fight. 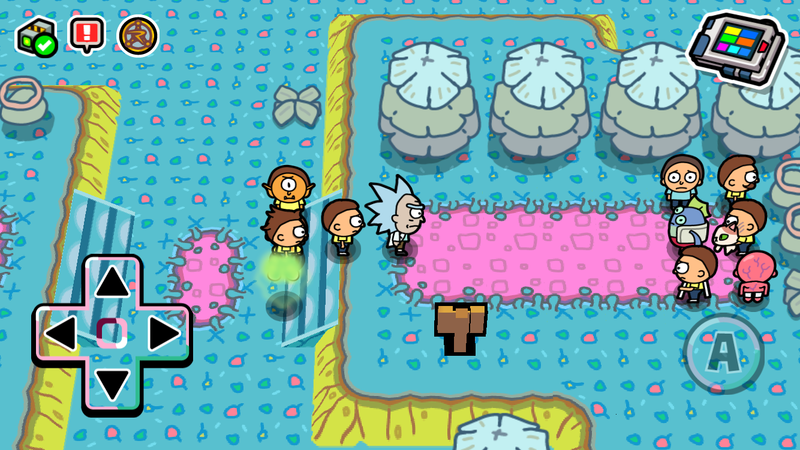 Pocket Mortys is only slightly more than kiddie-pool deep, but it’s enough to keep you going. Instead, a lot of its charm is in its humor. You’ll encounter a varied range of aliens who are all collecting variations of your grandson. Defeat them. Absurd but oddly accurate sci-fi: Morty, of course, is a reluctant fighter, so half of the fun of the game is listening to him whine to Rick and then listening to Rick mock him further. The moves, dialogue, and collectable Mortys are all ridiculous. 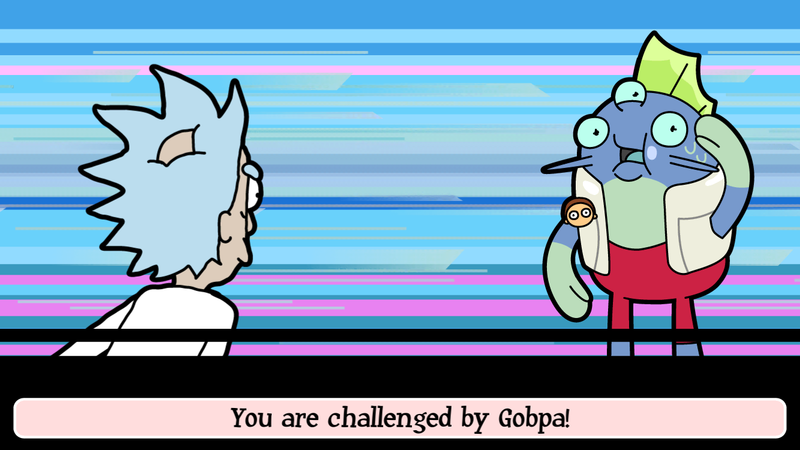 The game will earn several hours of your time just as you try to find the range and rarity of the collectable Mortys… and their absurd move sets. 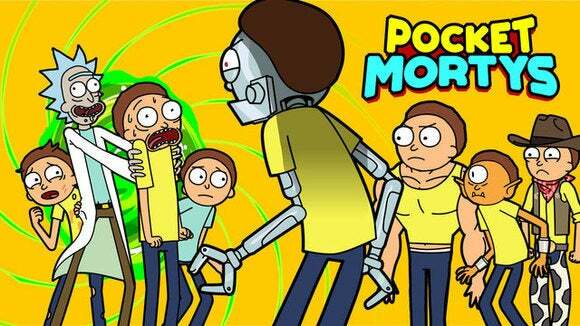 You’ll also come across some interesting versions of different universe Mortys. Go Stray Cat Morty! Additionally, several of the TV show’s actors lend their voice talents to the game, which is one of the main reasons why the humor shines through. You’ll encounter Morty’s pathetic father Jerry, Birdperson, and other recognizable characters and aliens from the show. The game explores and exploits alternative universe/multiverse theory (a constant element of the show), with not only alternative versions of Morty, but of Rick as well. Of course, all of these variations of Rick seem to retain his cruel disregard for his grandson’s safety. Pocket Mortys offers just enough nods to the source material to satisfy dedicated fans, while also being a fun, approachable game in its own right. For fans of collection-based RPGs that want a more absurd, lighter investment, Pocket Mortys may be just what the mad scientist ordered.